To make Hibiscus Tea Simple Syrup, mix sugar and water in 1-quart saucepan. Heat to boiling over medium-high heat, stirring until sugar dissolves. Remove from heat. Add tea bags; steep 5 minutes. Remove and discard tea bags; set aside 1 hour to cool. Transfer to a storage container. Cover container, and refrigerate up to 1 week. Makes 1 1/2 cups. 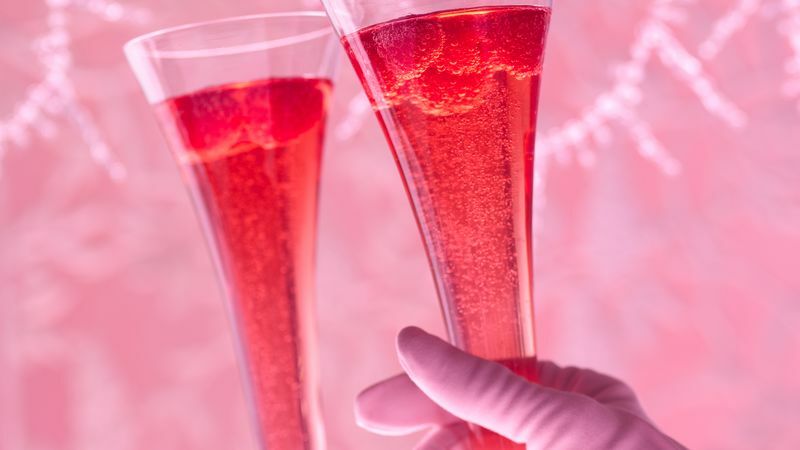 To make cocktail, add 2 tablespoons simple syrup to a champagne flute. Top with champagne. Garnish with raspberries or lemon twist. Feeling adventuresome? Instead of using tea bags, you can steep 1 tablespoon dried hibiscus flowers. Make sure you strain the simple syrup. Dried hibiscus flowers can be found in Latin markets. Nonalcoholic Version: Use chilled sparkling water instead of the champagne.